In 2016, Boyette Strategic Advisors completed a nine month analysis of east Kentucky's workforce to determine what skill sets existed among the labor pool, the availability of certified training to enhance those skills and how these skills may be transferable to other industries. What they found was a highly technically skilled workforce, adept at mechanical tasks, easily transferable to metalworking manufacturing and a work ethic second-to-none. Below are additional findings about this labor force and how it is driving our recruitment efforts to Targeted Industry Sectors at One East Kentucky. 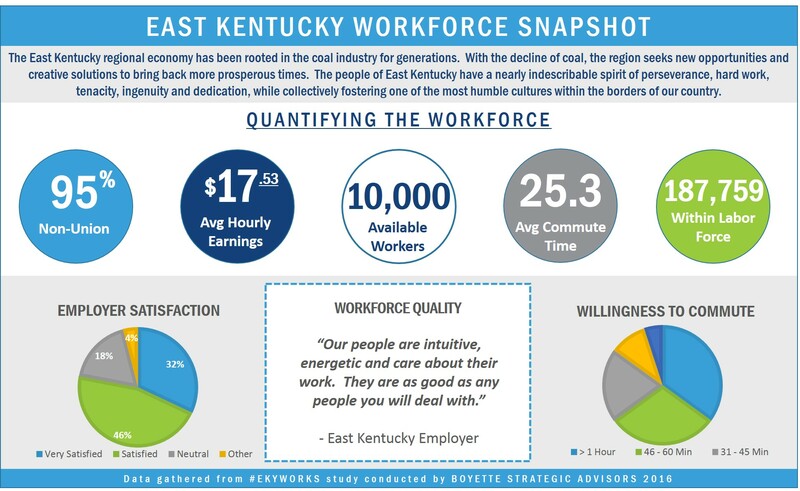 The cost of the East Kentucky workforce is viewed as a value by employers, with many saying the cost of labor is inline with or less expensive compared to quality. 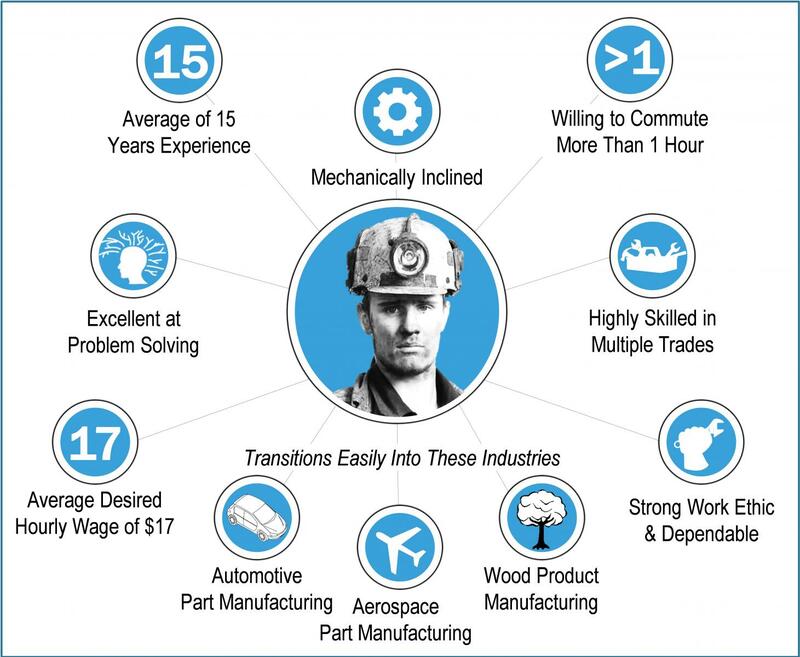 Based on the data gathered by Boyette Strategic Advisors in our comprehensive workforce analysis, the below image was produced to sum up key findings about the average coal worker. Understanding the competencies of our Coal Workforce was essential in determining what type of jobs and industries they transfer into the easiest. Each former mining labor occupation has been broken down to the skill level and that information is available for site selectors and companies seeking a more in-depth profile. We will share the data which lead to the conclusions for our Targeted Sectors and how our workforce is well-suited for Automotive, Aerospace, Plastics, Wood and other manufacturing sectors. An example of this information is below. The Compatible Occupations Identified for the mining occupations were further examined to determine those that have the greatest opportunity for transferable skills. The information below provides a listing nationally that employ the compatible occupations that present the greatest opportunity for mining workers. Metal and equipment manufacturing, as well as transportation equipment manufacturing offer significant transferable skills opportunities for our workforce. Plastics, Wood Products, and Transportation/Warehousing are additional compatible industry sectors. Below are examples of three occupation codes in the mining workforce and their compatible occupations. Gathered from the EKYWorks Study, the information below details the nine county region of One East Kentucky. Individual labor sheds pertaining to our industrial site and building locations are available as well, but many of them share a similar labor pool. Similar to the Labor Profile, the information below details employment statistics of the nine counties within the One East Kentucky Region.